is worth the effort! Yesterday we got a package in the mail from my mom. It was full of Halloween decorations: a black cat, a spider-my girls fight over who can carry it around next-, a Happy Halloween sign, window stickers, regular stickers and a card. Everything was taken out and used right away. We got the package the day before Halloween, so it would only be enjoyed for a few days, but those few days were more special and memorable because my mom spent a few dollars and few minutes to send us something different and fun. When the girls opened the package it was magical and it made me miss my mom like crazy! My mom is a fun person who has always had a gift for making life enchanting. She still enjoys the smaller moments, and growing up we had traditions that, to this day, are so important to me. Think about your own family traditions. What first comes to your mind? Did these traditions teach you about the importance of family and your family culture? Is it easy to recall the important traditions? For example, when I think of Christmas, I think of a specific decoration that came out every year. Cody’s favorite was a set of Christmas mice and mine was a Santa face mobile made out of cardboard and felt that to continues to creep out my brother-in-law! =) Most families have traditions that revolve around events, food, and things. Most traditions are simple and easy, but the impact is huge! Behaviors and actions that you engage in again and again—regular rituals you perform at the same time and/or in the same way. Traditions should be personal and full of purpose. They should require thought and intentionality. Provide a source of identity: They tell a story about a family. It can help children understand where their family came from and what they are all about. Strengthen family bond. Traditions usually involve unity and face-to-face interaction that is becoming more rare in this technological age. Traditions create trust and helps family members feel like they are part of something special. Offer comfort and security. Especially important in times of change and grief. A constant in a fast-paced, ever-changing world. Teach values. Daily family prayer teaches the importance of faith; nightly bedtime stories teaches the importance of education, reading and life-long learning; family dinner and activities instills the value of family solidarity. Add to the rhythm and seasonality of life. Rituals can give children consistent events to look forward in anticipation and something to look back on with satisfaction. Breaks the monotony of life. Pass of cultural and religious heritage. Religion and family history are a great place to look if you want to start some meaningful family traditions. Read Elder Perry’s “Family Traditions” for more ideas. Connect generations. Extended family gets involved. Find Purpose and then make it Personal—Ex. Purpose: to teach the importance of gratitude at Thanksgiving. Personal: The Thankful Box is when everyone writes something they are grateful for anonymously and then while they eat pie they take turns pulling out the pieces of paper and guessing who wrote that entry. 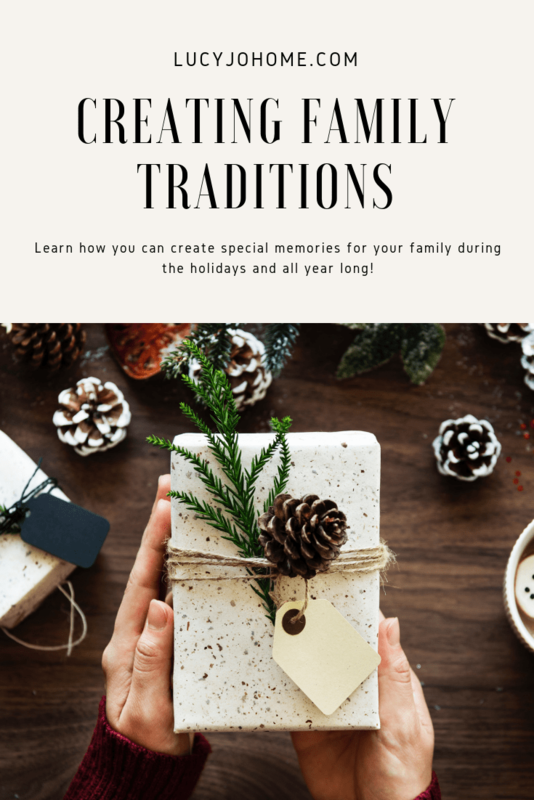 Incorporate traditions from childhood, but focus on creating your own traditions with you new family. Ex: Cody’s Mexican food traditions and my Filipino food traditions mixed. Create and eliminate traditions when needed. Change it up as the family grows. Traditions should be fun and not stressful. Don’t go overboard and take it slow. 1. Daily Connection Traditions—remember these need to be intentional. Don’t let watching TV or staring at your tablet or smartphone be your “traditions”. Most traditions will come from daily routines. Can someone share an example? 2. Weekly Connection Traditions—Family home evening, Sunday tacos… More examples? “The Lord has not been so explicit in providing us religious customs along the order of feasts and festivals to remind us of the blessings we receive from Him today. However, the practice of having traditions to keep us close to the great heritage which is ours to enjoy should be something every family should try to keep alive. Daily we should kneel in family prayer and study the scriptures together. Weekly we should observe the Sabbath day by attending our meetings, especially sacrament meeting, and behave appropriate to the activities that are proper for the Lord’s day. We should also gather our families together in weekly family home evenings. Perhaps it would also be appropriate to have a date with our wives each week, to remind us of the great blessing they are in our lives. Monthly we should fast and pay our tithes and offerings to the Lord. Semiannually, we should make listening to the messages delivered at general conferences a family tradition. We should organize, annually, family reunions to keep alive our great gospel heritage. Other traditions which should continually be part of our lives are receiving father’s blessings, patriarchal blessings, missionary preparation, temple preparation, and regular temple attendance where possible, and being together as family units on those occasions when sacred ordinances are performed in behalf of a family member. Much of the information in this article comes from www.artofmanliness.com. Check out their article for more specific lists of 60+ ideas.